Built in the XII century in Romanesque style and progressively altered by subsequent restoration works, the ancient parish church of Monte San Savino shines with its secular, religious and historical memories of local devotion. Two kilometers away from Monte San Savino, we can find the church of Le Vertighe (XVI century). Its current appearance is due to the restoration works wanted by the archpriest father R. Franci OFM. This church was built upon the request of the Augustan friars in the XIV century. Its grey stone facade has an upper part with a rose window, probably by Maso Porro and a lower part with a lanced arch and some intricate little columns revoking the late Gothic Humbrian style. Its right side leans against the roof garden of Di Monte Palace while its left side is against the former store house of Fontarronco's farm. 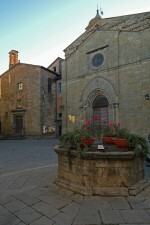 In the XV century it was an oratory dedicated to Saint Anthony and seat of the homonymous company. 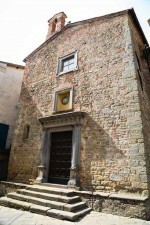 Initially, it was possible to enter the church only by going throught the cloister of the church of Saint Agustín to the Tuscan door by Andrea Sansovino. 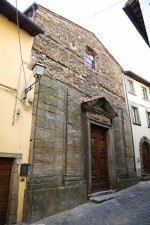 At the beginning of the XVII century this building was restored completely by Orazio Porta and probably during the restoration works the positioning of the church was changed. 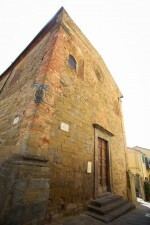 After suppressing the religious fellowship, the church was used as a barn until 1819, when Paolo Girolamo Galletti bought it. This church was built in the XVII century. Its simple and elegant façade is covered in stone. The construction of the church was never completed as we can see by its pilasters strips. The bell-gable on the right wall has four hollow round arches. 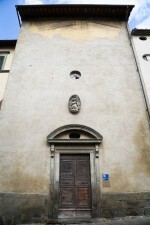 The church was built by the worshipers of Saint Joseph in October 1711, allowed by Gran Duke Cosimo III.